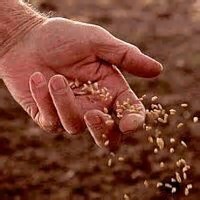 Jesus tells us in today's Gospel that "unless a grain of wheat falls to the ground and dies, it remains just a grain of wheat; but if it dies, it produces much fruit." Then Jesus says that he is troubled. "Yet, what should I say? Father, save me from this hour? But it was for this purpose that I came to this hour. Father, glorify your name." Then a voice came from heaven, "I have glorified it and will glorify it again." The crowd heard it but some said it was thunder but others thought an angel had spoken to Jesus. Jesus told them that this voice did not come for his sake but for theirs. And Jesus said, "When I am lifted up from the earth, I will draw everyone to myself." Jesus knows that the hour has come for the Son of Man to be glorified. He is trying to prepare his friends for what he is going to suffer for them and for us. He himself said that there is no greater love than to give one's life for another. Am I ready to go with Jesus now, to be with Jesus during these two weeks that remain before we celebrate his resurrection? What am I doing for Jesus? What will I do?